Nouwen's quote summarizes, in some ways, what I was reflecting on yesterday in my Ash Wednesday 2010 post. This identity was embrace during Lent is our true identity given to us out of God's love in our creation. Sin is, by implication, our failure to be ourselves. When we repent on Ash Wednesday we repent of our sin and we move forward in our true identity. But this blessed identity is not one of self-indulgence or streets of gold. It is the identity of bread. 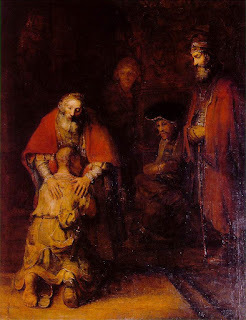 As Nouwen puts it, "like Jesus, we are also taken, blest, broken and given, because, like Jesus, we are beloved sons and daughters from our very beginning."